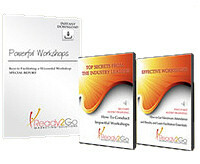 Teleseminar & Self-Study Coaching Program: Overcoming Procrastination - The Art Of Getting Things Done Now! 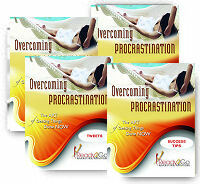 from Ready2Go Marketing Solutions, Inc.
Have you ever procrastinated? Your answer to this question is most likely – yes! Everyone has put something off, convincing themselves that they will get to it at a later date. Procrastination involves an inner conflict between something we want or need to accomplish and a resistance to actually doing it. Even though procrastination inevitably shows up in each of our lives, we can’t take its presence lightly. And in today’s fast-paced world, it’s even more important that we manage our time efficiently and limit procrastination as much as possible. Overcoming Procrastination will have huge interest for your participants as it will increase their awareness of what procrastination is, why they do it, and what can be done to overcome it. Your participants will regain their personal productivity, lessen their sense of guilt, re-energize their motivation, and develop specific strategies for dealing with this annoying habit so that procrastination no longer negatively impacts their life. Activity Objective: Participants discuss what procrastination is by looking at examples of it from their own lives..
Activity Objective: Participants review the different reasons why we procrastinate and rank them in order. Activity Objective: Participants learn about the important signs to notice that indicate if they are procrastinating. Activity Objective: Participants become aware of procrastination warning signs that appear in their lives. Activity Objective: Participants learn a procrastination matrix that can help them identify various strategies for overcoming their procrastination, and then apply it to a situation in their own life. Activity Objective: Participants creatively capture a main point they have learned about the topic of procrastination that they will remember after the training and apply in their life.